I have been reporting about the stadia issue in Italy in some detail in order to keep you apprised of perhaps the most crucial issue effecting Italian football's future. In my discussions about Legge Crimi being stuck in the Italian parliament and how clubs are moving in response to that impasse, I had suggested that a club's success to own their stadium depended on the willingness of the city councils with which they were negotiating. While Maurizio Zamparini's bluster in Sicily has not really resulted in any appreciable movement, Napoli president Aurelio De Laurentiis seems to have made some progress in a bid to take ownership of Stadio San Paolo. 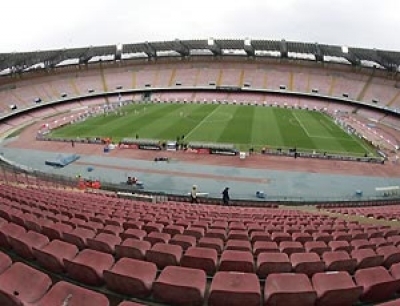 News from Italy indicates that Pina Tommasielli, the Councillor of Sports in Naples, is working with De Laurentiis on a deal that would see the latter take ownership of San Paolo, allowing redevelopment of the stadium. As I wrote earlier, De Laurentiis also plans on revitalizing the Fuorigrotta area, the site of the San Paolo, during the upcoming summer, an ambition that is most probably at the heart of the negotiations. Napoli's 1-1 draw in the Champions League group game against Bayern Munich on Tuesday was watched by a sold-out crowd at the San Paolo, which can hold a little over sixty thousand people. However, the method of ticket sales and allocation were criticized by the Italian media, and De Laurentiis irately, and somewhat justifiably, responded to the attacks by indicating that once he owns the stadium, then and only then will people have a right to criticize such matters. Hopefully for Napoli and Italian football, he can take ownership of the Stadio San Paolo soon.